As I have said before, I like to link gifts to a theme particular to the intended recipient. In January I made some birthday gifts for a friend with a cat – enough said! 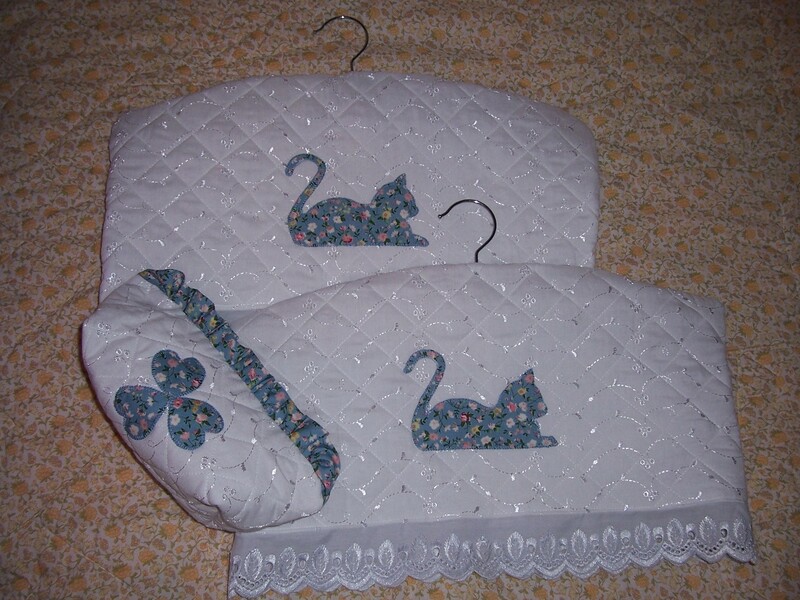 The padded coathangers were made using a pre-quilted broderie anglaise from my stash as was the wide broderie anglaise trim. The appliqué outline was sourced from free images on the internet. As I had some quilted fabric left over I ran up a pretty zipped cosmetics bag. Unfortunately I did not have sufficient fabric for yet another cat appliqué so this time there is a clover shape from hearts. I have now run out of the basic wooden coathangers that I use for this project but found an alternative supply from Homebase which I am keeping “in stock” ready for the next birthday.